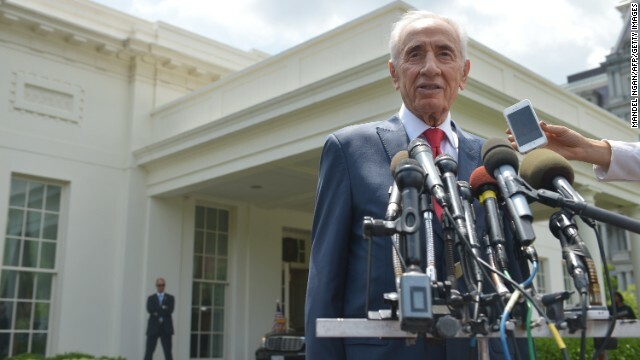 Washington (CNN) – After more than six decades of public service, Israeli President Shimon Peres paid his last official visit to the White House on Wednesday. The Israeli leader discussed with President Barack Obama the wavering stability in the Middle East as civil uprisings in Iraq and Syria plague the region, as well as Iran's nuclear program – an issue Israel sees as a major threat to its security. “To do so, you need (to be) ready to stand a mighty army to force all the three parties together. I don't see the army to do it and I don't see the parties that will agree to it,” he said, referring to the apparent collapse of the unity government in Iraq, and incursions into major cities by insurgents there. The Israeli president said the Kurdish region of Iraq was one of the few success stories to come out of the Iraq war. "In the present situation we have two different parts – one because the three parties are the Kurds, the Shiites and the Sunnis. The Kurds already built a state of their own. They are supported by Turkey and are basically democratic. For example, women enjoy their equal rights which it the first sign of democracy." he said. As for the escalating tensions between Sunnis and Shiites in Iraq and Syria, the Israeli leader said he believed it should not be the role of the United States to take sides in religious battles. Poll: Is U.S. doing enough to quell Iraqi fighting? "The difference between the Shiites and Sunnis is more an Arab problem than an American problem or a problem of the world, and I think the Arabs should come in and play a major role because I don't think it's for the West to decide who is the real heir of Muhammad." Peres also expressed concern over Iran’s nuclear program. "If Iran will continue to build a bomb, the result is the Middle East will become nuclear,” he said. “The best way to reach an agreement is to follow the example of Syria - send out the dangerous weapons of the land, don't keep it inside." Peres was referring to the United Nations' brokered program to dismantle and remove all chemical weapons from Syria. After the meeting, the 90-year-old Peres told reporters at the White House that over his 60 years in government service he has met with 10 U.S. presidents. "I told the President that among all of you I am the oldest man, so I met 10 Presidents. The first I met was President Kennedy. At that time the United States wouldn't agree to supply us arms. And now I come to a President who answers, really fully all the security needs of Israel." According to his official biography, Peres served as a member of the Knesset, or Israeli parliament, for 48 years and has served as a minister in 12 cabinets, including two stints as prime minister. He was elected president in 2007. On Thursday, Peres will be honored by Congress as the House and Senate leadership present him with the Congressional Gold Medal. to which obama responded, 'there is something going on in iraq? i missed that in the newspaper this morning. oh well, gotta run to my next fund raiser. toddles!" Can anyone solve the middle east problems? There are no solutions of religious dictatorship, imposing its will on everyone in the world. "A president who answers really fully all the security needs of Israel." Pssst....little advise......do not repeat this when they give you your medal. Given that the English more or less created the modern borders of Iraq, President Shimon Peres' question is a good one. Is there a good reason for trying to force people to live in an artificial nation-state? It never was possible for Iraq remain a united country. What do Nouri Maliki and Ahmed Chalabi have in common ? They are both Shiite , both favor Iran , both trusted and appointed by GW Bush . Love to have been a fly on the wall in that meeting. I would pay money to hear some stories from Shimon Peres. What a survivor and life that man has lived. "There are no solutions of religious dictatorship, imposing its will on everyone in the world." Did you forget that you're a conservative? It's not. DUH. The manner in which arrogant Europeans drew the lines on the map in that region...and heck, I'll go right ahead and include Israel in that too...was and has been one of the most epic displays of cultural ignorance in human history. "And now I come to a President who answers, really fully all the security needs of Israel." And yet Bibi doesn't like him because he won't support the conservative party's expansionist plans and behavior. And "W" was the match.
. And now I come to a President who answers, really fully all the security needs of Israel." B-b-but I thought that Israel was behind Mittens and all the Republicans? You mean out of ALL the Presidents that he's met THIS ONE is the one that has most impressed him? Well how about that haters? @drake mallard: Ah, but the repub/tea bags of today have the memory of a gnat and have been so filled with hate for President Obama that they will believe whatever fox and hannity and rush tell them. Oh, and they'll continue opening their wallets to the party intent on screwing them over. GHW was right in not marching into Baghdad like Gen. Schwartkopf wanted him to. And GW was utterly and totally wrong and incompetent to invade Iraq on false pretenses and ignoring HIS generals who told Rumsfeld to go in with a much larger occupying force. Everything GW has ever touched has turned to scheisse, from ball teams to the economy to foreign policy. And we're all continuing to pay for it and will for generations to come. @Chris-E...al: "There really are no good answers at this point . The mideast is one large powder keg with a very short fuse"
And the lines are drawn based on religion. Another reason the Founders of our nation included the establishment clause. Tighten security, and immigration into USA. Now. And they say Obama is anti-Israel? The federal option once on the table but rejected by us diplomats at the time is how this may resolve itself eve maybe without a war. The reality on the ground is Kurdistan effectively exists already and they have shown they can defend their borders against ISIL. Maliki has and will continue to run the government and will not step aside. Maliki is concentrating all his forces to protect the Shiite parts of Iraq which he all the Shiite militias will fight for tooth and nail if invaded. Jordan and Syria will be pushed by Maliki and also quietly behind the scenes to recover any lost border control points' US drone will be used to support that once adequate Intelligence is obtained. Whether the Sunnis in the segregated Iraq will tolerate for ever the religious extremism of ISIL will be for them to decide and may eventually lead to them fighting their own war against terrorists ISIL.